If you do an Internet search for “Catholic Fatherhood” how much data would you find in comparison to Panda Bears, Applied Linear Algebra, and Welding Theory? 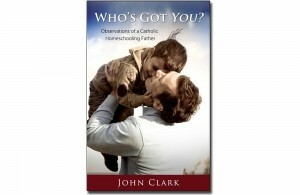 According to John Clark, author of Who’s Got You, Catholic Fatherhood comes in last. The results respectively were 1,914, 1,706, and 284. Catholic Fatherhood netted 270 results. Clark surmised that the results would lead one to think that fatherhood was irrelevant, at least in relation to welding linear algebra and pandas. As the homeschooling father of nine and husband to Lisa, he begs to differ with such a woeful assumption. “The relationship between a father and his children is not merely a monetary affiliation. Raising children does not mean handing them a paycheck. It means preparing them not merely for this world, but for the next.” And such a task is incalculable. So, Clark aims to lift the status of fatherhood with wisdom, wit and stories from the trenches. He takes the reader through the everyday life of homeschooling Dad intent on getting to heaven and taking his family with him. Recognizing that the responsibilities of fatherhood are enough to make one tremble, Clark shares a secret more powerful than kryptonite for Superman: “God has me.” For in the end, that is enough because it is everything. Clark begins by suggesting the three things that will bring us all closer to Jesus: confession, adoration, and the rosary. He sells us on their power and then lays the spiritual cards on the table by asking what is at stake? The answer is, the souls of our children. Clark acknowledges that there is more than one path for schooling, but for his family, homeschooling is the way. He points out that regardless of the choice for schooling, it is our children’s grades are not of greatest concern. Thus, he gives points to ponder for anyone with the desire and inspiration to homeschool but lacking the courage. “For the record, I have never heard a tear-jerking story about a child behind in math class. A father doesn’t say things like: ‘Mine is a tragic tale of woe…my son is a year behind in algebra.’ A mother doesn’t sob herself to sleep because her daughter didn’t finish her Phonics 5 homework. I have never heard a distressing story about a boy not making it to professional soccer.” Instead, he shares that the painful stories are about one thing—children losing their Catholic faith. Clark acknowledges that homeschooling does not ensure salvation but he explains that it does guarantee other things. For instance, rather than spending six hours a day away from home, it allows parents to be the primary influence in their children’s lives. Although much of Clark’s book is relevant to anyone homeschooling, he speaks specifically to dads. A male perspective amid humor and foibles, leads to laughs along with inspiration. Even though I’ve never been a dad, the book was entertaining enough that I read the whole thing. Otherwise, I would have missed gems such as Clark’s description of his inept swimming—like on a treadmill only underwater. Then there were scenes from his adjustment at college. Rather than start out with his superior writing skills thanks to being the son of Dr. Mary Kay Clark, founder and director of Seton Home Study School, he candidly shares aspects of his adjustment. One of the biggest adjustments for him was that there were other people in his classes. Whereas previously he could lift weights and clean his room while listening to Christ the King Lord of History on audiotape, now he had to sit still and take notes. Taking notes was so foreign to him that he was not sure how to do it. He promised himself right then that he would teach any future children how to take notes. Admitting to being somewhat AD/HD, he had asked his composition and rhetoric teacher if he could leave class early. When she wanted to know why, his reason was that his attention span was nowhere near an hour and fifteen minutes. He did adjust to college life and his ability to write stellar research papers, led the way to a degree in political science and economics. Throughout the book, Clark breaks down fathering and homeschooling down to it’s ultimate value—to lead our children to Christ not by sheer brilliance but by love, desire and seeking to put God first in our families. It is a book written by a Dad speaking to other Dads, but that does not mean women can’t read it too. But given that there is so much more written about mothering, this book is a welcome addition to homeschool reading. And personally, I think it’s way more entertaining than anything you might read on welding theory, applied linear algebra or even those adorable panda bears.